Few men in history have been as completely vindicated in the aftermath of total defeat as George McGovern. Richard Nixon was the walking incarnation of the dark side of the American dream: a man who lied as easily as he breathed, a boot-licking toady to those with more power than him and a backstabbing thug to all those with less. 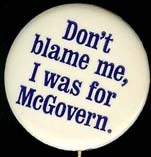 McGovern had more decency and honor in his fingernail trimmings than in every aggregate cell of Nixon’s body, and his entire life of service in the aftermath of the 1972 election is testimony to that bedrock fact. The fact that the United States elected Richard Nixon president over McGovern proves just how far from our ideals we fall. The fact that we are capable of generating men like McGovern in the first place is the only reason to have any hope that we could yet come closer.